The question on the connection between recessions (or business cycles in general) and potential output (“the trend”) is one that has not been studied much in economics. Most of the models we use tend to think about the trend as being independent of business cycles – so recoveries always bring output back to the pre-crisis trend. Policy makers tend to use the concept of the output gap, the deviation of output from its potential, to think about the strength of the recovery under the assumption that in a “normal” year the output gap should be back to zero. 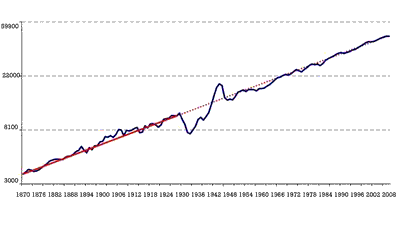 In fact, using 1870-1928 data, a prediction using that (log-)linear trend leads to an error of only 1% for the level of GDP per capita in 2008. Of course, the picture is misleading in the sense that in some cases it took a long time for the economy to come back to this trend, but it is still interesting that it returned to the same trend. It could have returned to the same growth rate but at a different level but that’s not what we see, we see that the output loss is always recovered after a number of years. This suggests that the supply side of the economy (innovation, technology) is unaffected by output fluctuations. If one looks more carefully at the data, the evidence becomes much weaker. In contradiction to what we see in the picture above, empirical economists know that output fluctuations are very persistent. In fact, one cannot reject the hypothesis that all output fluctuations leave a permanent scar in the economy. If we suffer a recession, output never goes back to trend, it remains at a lower level forever (this is what is known in the academic literature as the existence of a “unit root” in output). 1. Technological changes are the cause of business cycles. Recessions are period where we are not good at innovating and this causes both a recession and a permanent loss in output. This is what we know as “real business cycle theory”. What Ended the Great Recession? Models Used for Policy Should Reflect Recent Experience, But Do They?